Orvieto is a picturesque town sitting high up on top of a steeply sloped butte in the region of Umbria. Orvieto Classico is a DOC designated wine that is produced entirely within this defined “classic” area and solely with grapes grown within this area. 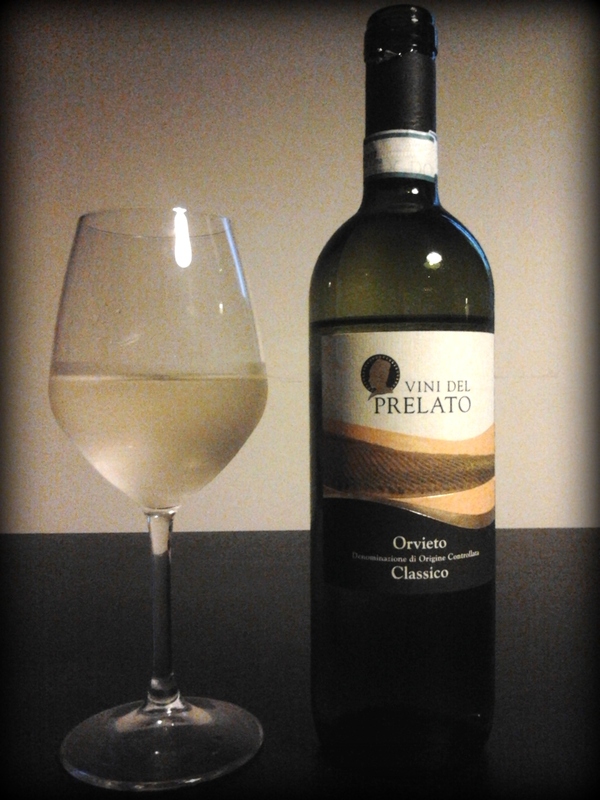 The “Classico” tells us that it was grown/produced in the oldest, or classic, area of the Orvieto wine region. Grape: Grechetto, Trebbiano (aka Procanico in this region), Malvasia, Drupeggio, and Verdello. Percentages of each grape are not specified but it is listed in order of largest % to smallest %. Orvieto Classico’s are required to have at least 40% Grechetto and anywhere from 20-40% Trebbiano, so knowing that we can assume these are the main stars in this bottle. Aged: This is a youthful wine that hasn’t touched any wood and definitely hasn’t rested very much before release. Recommended Serving Temperature: 10-12 degrees Celsius (slightly chilled). I’d recommend NOT drinking this too cold, because it’ll lose all its flavor if too chilly. Take the bottle out of the fridge for 15 minutes and you should be at about the right temperature to enjoy this right. My Tasting Notes: This pale lemon colored wine is easy-drinking, fairly simple, but not boring. On the nose you get lemon, apple, grape, white blossom, and this is what you find when you drink it too with the addition of white peach. It’s crisp and refreshing (that acidity will make your mouth water for sure!). There’s a brief aftertaste of almonds and grapes that are just starting to raisin. The Verdict: This is a young wine that is meant to be young…so drink it now, don’t wait! While this might not be a wine to search high and low for, it’s as good as one would expect for an Orvieto Classico. This is great as a first-bottle-of-the-evening, since it’s lower in alcohol, would go well with appetizers, and pretty easy to drink. I recommend drinking this on the slightest side of “slightly”chilled, because it’ll lose all flavor and aroma if it’s too cold. Food Pairing Ideas (but as usual, there are no rules set in stone, eat and drink what you like! ): appetizers (chips, olives, fried goodies, bruschetta), light main dishes like fish (white fish or delicate salmon, not tuna steak) or marinated chicken with lemon and rosemary. Nothing heavy or sharp/intense, like Gorgonzola sauces, BBQ, or steak! Since this wine is dry, I wouldn’t drink this with anything sweet like dessert or fruit. This entry was posted in Grapes: White, Tasty Notes, White Wines and tagged Grechetto, Italian wines, Italy, Orvieto, Orvieto Classico, Trebbiano, Umbria, Veni Vidi Vino Italy, White Wine, Wine, Wine Food pairing, wine notes. Bookmark the permalink.